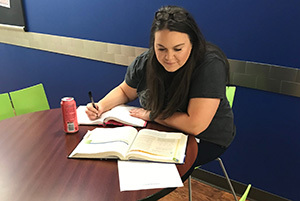 Rachel Rogatski of Allen, Texas, plans to use the UIU education she has obtained through the University’s CAP program as a way to continue growing as a GEICO associate. After being employed with GEICO for three years, Rachel Rogatski realized she wanted to pursue a supervisory or management role with the insurance company. She also understood that to achieve this next step in her career, she would need to complete the specific college-level business classes. This opportunity was realized when the 28-year-old aspiring manager found her path to opportunity through a Corporate Advantage Partnership (CAP) between GEICO and Upper Iowa University. Already possessing a bachelor’s degree from University of Michigan, Rogatski admits to originally entering the classes with a mindset to simply finish and learn her coursework. She had no desire to go above and beyond what was required by her employer. However, after her Peacock experience the Northville, Michigan, native is considering the pursuit of an Upper Iowa MBA next year. Rogatski uses her newfound knowledge as a way to continue growing as a GEICO associate. She also applies her UIU education and resources to help coach fellow employees and better prepare herself as a future business leader. Corporate Advantage Partnership (CAP) program members, employees, their spouses and dependent children (under the age of 26) are eligible to receive set tuition grants for courses taken at any of Upper Iowa’s 25 U.S. educational centers or through UIU distance education programs. The application fee is also typically waived for all participants. UIU’s CAP program provides an extra benefit to corporate employees and their families while saving them money on their education. Those who are interested in learning more about the CAP program are encouraged to visit uiu.edu/corporateadvantage.